AutoVault's Media Rotation reports tell you and TSM which media to vault offsite and which to return. A report of your complete vault inventory is also created. These reports can be sorted by Vault, Library, VOLSER, Type, or Pool. Plus customized headings can be entered for each report. All three of these reports can be automatically emailed to one or more technicians or operators daily, automatically printed, and are always viewable from the TSM web interface. 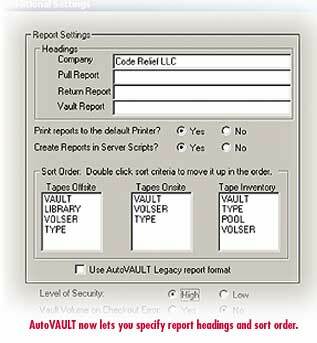 You can also reprint any AutoVAULT reports to any defined printer. Feel secure about the status of your data from any location! This report shows not only which tapes to take offsite, but it also shows any errors that occurred during the checkout process. You can enter a generic default report heading that will appear on all of your reports. You can override the default report title on each of the three reports. If you leave the Pull, Return, or Vault report heading blank, the default title will be used. Notice how you specify first, second, and third order sort criteria by Vault, Library, VOLSER, Type, or Pool in the dialog to the right. AutoVAULT maintains a log of all media changes in CSV format for easy reporting from Excel or other products. You specify how many days the log holds and older data is automatically deleted. AutoVAULT maintains this audit log file, av_audit_log.csv, in the debug directory of the corresponding server instance. The log data can be viewed with Excel or another reporting tool. The columns of data in order are: Date, Time, Volume Name, Media Type, AutoVAULT Action, Pool Name, Vault Location, Tape Library Name, and Tape Library slot. A blank is inserted when there is no relevant data for a field. An entry is created every time AutoVAULT updates a tape. This is a useful tool for debugging a problem or tracking your media movements, and auditors love this report!